Patch management should be on top of your top priorities as a Sysadmin and as a Security Analyst you should also be on top of the latest patches released by Microsoft, along any 3rd party software that your endpoints are running. The challenging aspect of patching servers is that if you don’t have any kind of patching solution (such as SCCM), the patch management process might become somewhat manual and not flexible as we’d like (Think maintenance windows, scheduled reboots, etc). In addition, Sysadmins or server owners might not patch their servers because they think it will “break” their systems/applications or simply they forget. The point of this article is to accomplish somewhat the same functionality we get from SCCM when it comes to scheduled installs, and suppressed reboots. Let’s get to it! 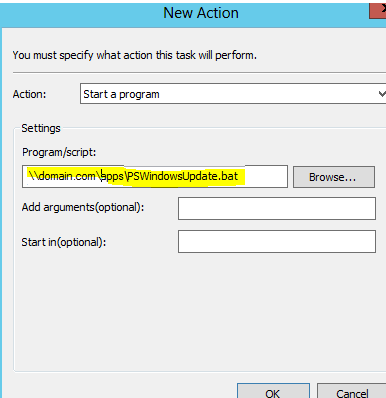 You don’t have SCCM (Which is why you’re probably reading this article), if you do have SCCM disregard this article and take advantage of it. Since we know that Sysadmins or server owners are forgetful, let’s try to automate this process. 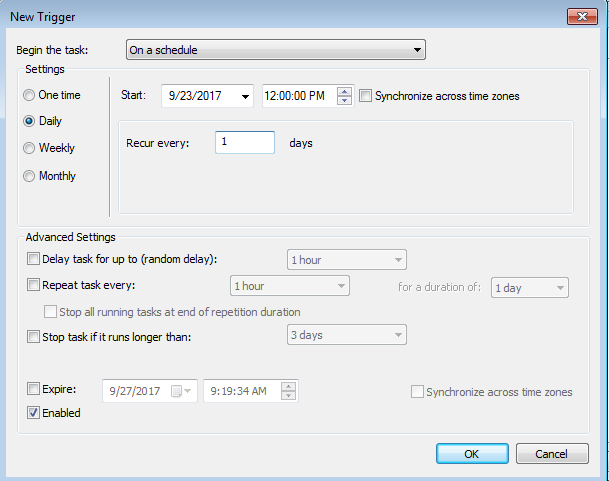 Just how in SCCM you would schedule a deployment at a certain time, but not reboot it until say a Saturday morning, we will try to accomplish something similar. 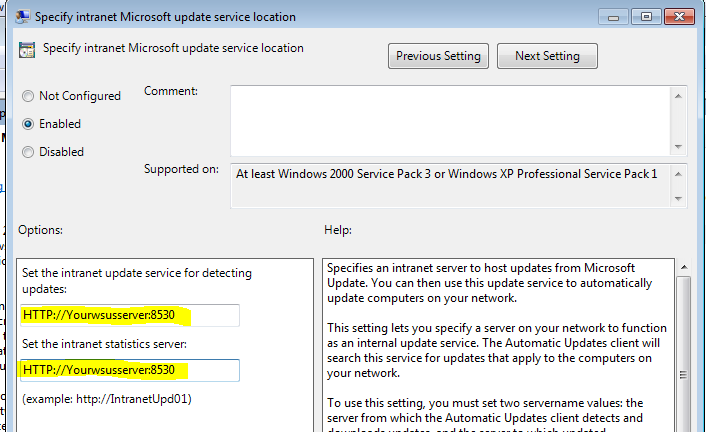 On Patch Tuesday (2nd Tuesday of the month) when Microsoft releases their updates, our WSUS server will auto-approve new updates that will be downloaded by these servers. 7 Days after the updates were released, a scheduled task will trigger at 5 a.m. that will run a PowerShell command which triggers the installation of those updates without rebooting them). Our assumption here is that 7 days will be enough to know if any patches broke our “test systems”, realistically your organization might wait a few weeks or months to ensure their test environment is normal post-updates. Additionally, if you don’t want to automatically download the updates from WSUS (say there’s a bad update), you can also delay the downloading of those potential “bad” updates. 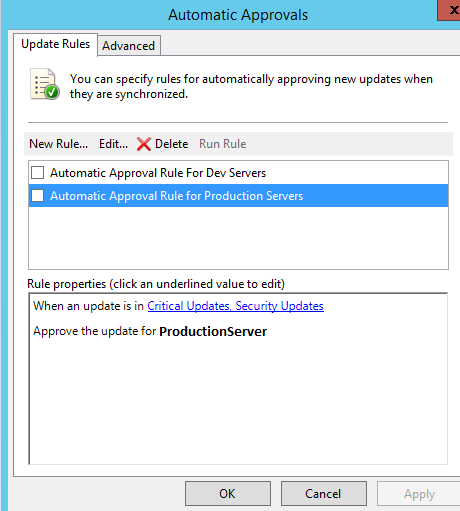 On WSUS, we will automatically approve Critical Updates & Security Updates. Browse to your GPO and edit. 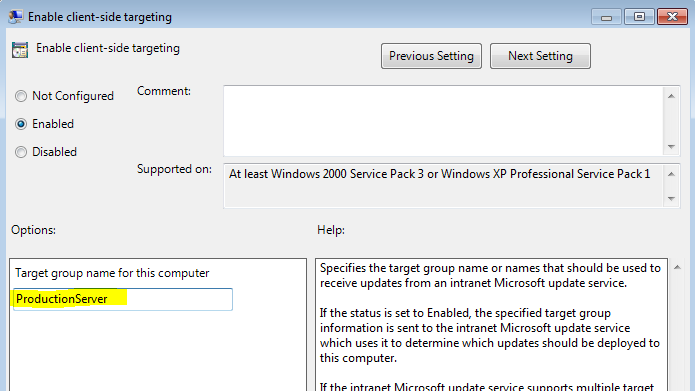 This will automatically assigned your endpoint to a specific WSUS group which allows any new domain-joined production server to be placed in the correct group and help with the automated process. 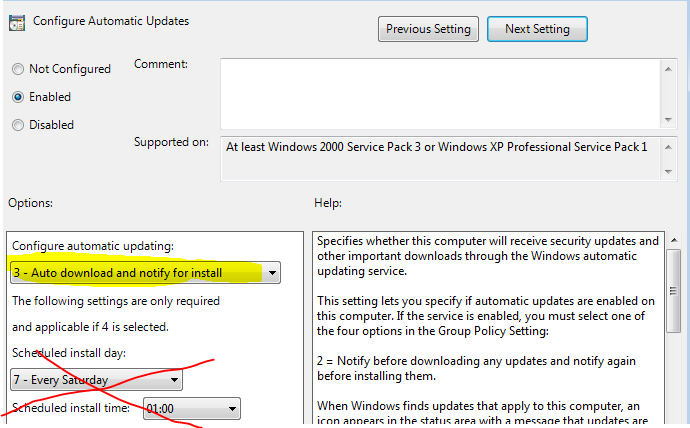 Disable the Allow automatic Updates immediate installation option. 5. Here’s the remaining settings you may choose to follow or not. The highlighted ones are a “must” for this use case. 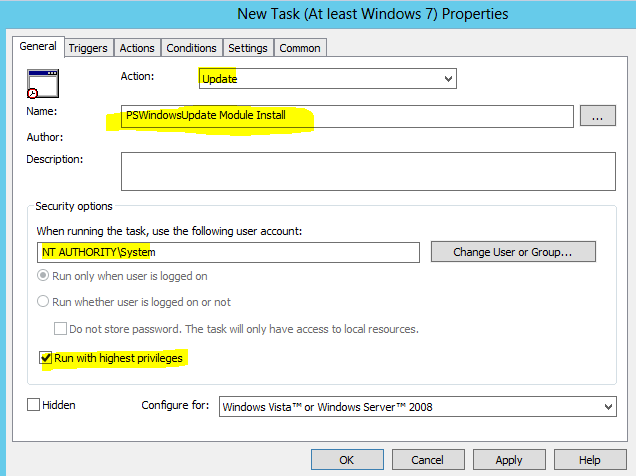 Now that you’ve setup your WSUS to automatically download the updates to our production endpoints but NOT install them automatically, we can now setup PSwindowsUpdateDeployment. 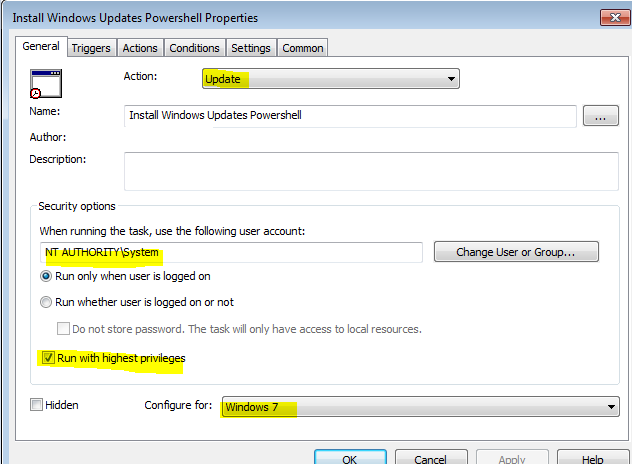 PSWindowsUpdate is a powershell module to manage Windows Updates on a Windows system. There are available functions that are available on the site, so read over it if you get a chance. First create a batch file that will be placed on the root domain folder that is accessible to each domain client. 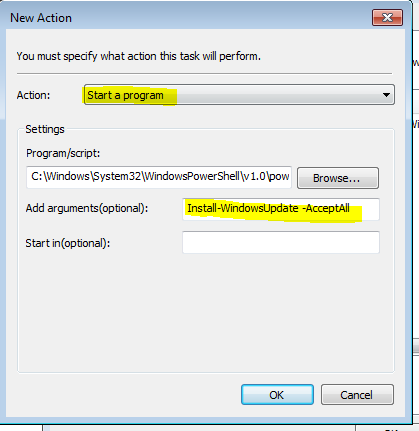 xcopy /z /y "\\domain.com\NETLOGON\apps\PSWindowsUpdate\*" "C:\Windows\System32\WindowsPowerShell\v1.0\Modules\PSWindowsUpdate"
Step 2: Download the PSWindowsUpdate.zip file from the Official Microsoft Site and extract locally. I’ve set mine to run daily at 12 p.m, you may schedule this to fit your needs. Browse to your domain location and select the batch file we created. Hit OK when done. 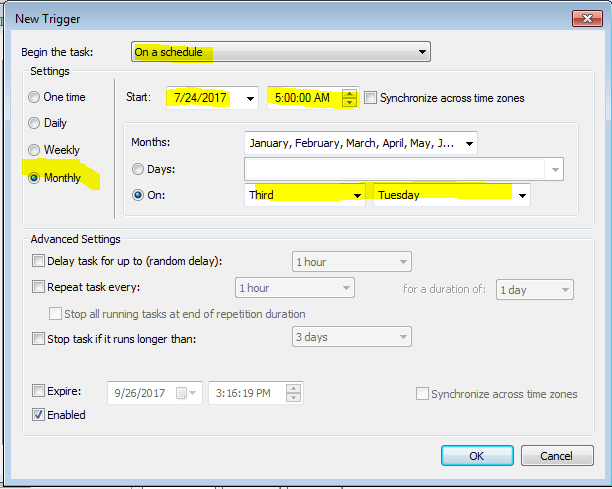 Allow task to be run on demand (This will allow you to manually trigger the scheduled task on an endpoint when you login. It helps with initial testing). Next, we’ll schedule the actual installation of the windows update. 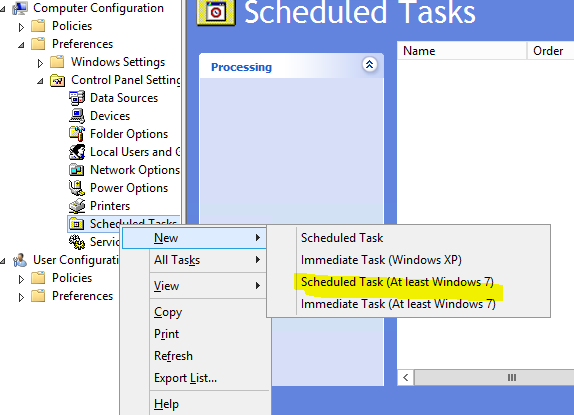 We will now create a “Scheduled task” that allows us to trigger the installation of the updates that were downloaded locally to our systems. This is it! now apply this GPO to your Production OU; however, first test this with a few test servers to ensure that it works as intended. 2 Comments on "Patching Production servers with WSUS & Powershell"
Looks like it’s a Windows Update Error, can you restart the client Windows Update services and try again? Otherwise I’d look into answers.microsoft.com or social.technet.microsoft.com.